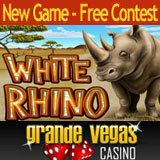 GrandeVegasCasino.com may wish it had never heard of its new online slot but players are sure loving the new White Rhino game. Especially the Frenchman who won over $110K playing it within hours of it launching! Mon dieu, no wonder players are flocking to it today hoping it continues to be so loose! Gilles R. from France won over $110,000 from a deposit of only $16 yesterday morning, just hours after the new game became available to GrandeVegasCasino.com players. He started betting only $2.50 per spin and increased his bets once he got a feel for the new game. Gilles’s highest win was $33,450 which he won while playing the “Guide Feature”, one of the free games features built into White Rhino. The Guide Feature awards ten free games with the chance to triple prizes. He also won payouts up to $5,900 playing the White Rhino Feature (which gives up to 30 free spins) and more playing the Kilimanjaro Re-spin where you can hold any reel to improve the combination on the next spin. The French winner could even find himself face to face with a real White Rhino since everyone that bets on the new White Rhino game (until June 30th) is automatically entered in a free contest to win an exclusive safari trip, all expenses paid. White Rhino is a 5 reel, 25 pay-line online slot machine. Its beautifully illustrated safari theme has White Rhino substitutes that appear grouped on the middle reels and triggers three free games features. White Rhino includes a huge top 5-of-a-kind prize of 30,000 times the line bet, plus multiple random jackpots giving everybody a chance to win big on their safari adventure.